Is Bigfoot’s Backyard in the Uwharrie National Forest? A fuzzy video of a furry beast with a sweet tooth has spawned an industry all its own in the Uwharries. Many in Montgomery County believe. Some worldwide believe. But do you? EDITOR’S NOTE: This story was originally published in April 2014. OK, this is what I hear: Bigfoot lives in the Uwharrie National Forest. He — or she — screams, cuffs tents, eats candy bars, leaves platter-size footprints, and knocks so loudly on tree trunks you can hear it miles away. I’ve talked to Bigfoot investigators and Bigfoot believers, and I’ve caught up with a gun-toting gold prospector who has a Bigfoot-hunting dog. Over the years, I’ve spent my share of mornings in Bigfoot Central: the Eldorado Outpost, the huge store at the northern doorstep of the Uwharries. Marion Owen and her family run the store, and they have checked out almost every inch of the forest outside their back door. She and her late husband, Rufus, came to Montgomery County in 1961, the year the Uwharries became a federally designated national forest. Rufus, a World War II veteran, was one of three foresters sent by the United States Forest Service and taught a generation of boys and girls how to hunt, fish, hike, and appreciate nature wherever they stood. So, Owen and her family know the Uwharries, and she can tell stories of the many calls and questions she gets about the long-haired, candy-loving creature supposedly living and hollering in their woods. Two nurses came from Morehead City to see for themselves. “Mrs. Owen, are we going to be safe?” one of them asked. “I can’t guarantee that,’’ Owen responded. Five seasons later, they still haven’t found anything. Bigfoot researchers came, too, arriving in RVs and toting expensive equipment. They come year-round now, filling the big parking lot at the Eldorado Outpost and setting up their equipment on the store’s three tables beside an upright piano, an old jukebox, and a bear carved from a log. Curiosity seekers come to see what the excitement is all about. They camp in the woods, hoping to see something, and they pull into the Outpost to buy one of the half-dozen different T-shirts in the back. This is all happening because of a grainy video. In 2008, Michael Greene saw a figure for a few seconds and had someone — or something — scuff his tent during a camping trip in the Uwharries. He heard breathing, deep and ominous, just outside his tent. He says it sounded like Darth Vader in Star Wars. The next year, Greene, 72, heard something again while camping. This time, it was a rustling in the woods. So, he turned on a thermal imager and digital video recorder right before midnight and left his campsite for two hours. He came back and found he had recorded a thermal image of a lumbering figure with long arms. According to Greene, the figure ate a Zagnut candy bar and took a squeaky toy that belonged to Greene’s grandchildren — a coiled rubber snake, nearly 3 inches tall. The infrared image is known as the “Squeaky Thermal” — and everyone in Bigfoot circles knows about the “Squeaky Thermal.” It’s considered by Bigfoot investigators to be the most important piece of Bigfoot footage captured in 40 years, and it was captured in one of the country’s smallest national forests. Greene once oversaw 250 investigators as the Chief of Welfare and Food Stamp Fraud Investigations in New Jersey. He is also a “court-qualified expert witness” on forgery. He’s now retired, living in Salisbury with his wife and traveling to various places to find evidence of Bigfoot. He has spent nearly $80,000 on equipment, and he has gone most everywhere — from the glacier fields of the Yukon and a giant meteor crater in northern Quebec, to the Everglades of Florida and the forests of the Pacific Northwest. His most fruitful place? North Carolina, an hour’s drive from where he retired. 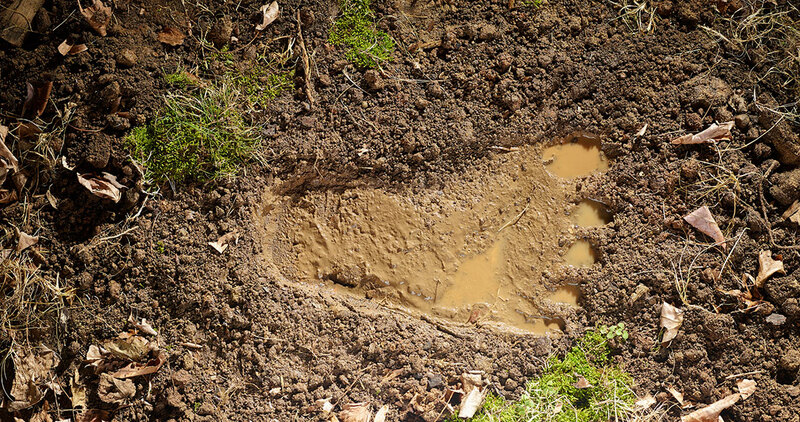 His discovery has given the Uwharries a new name: Bigfoot Country. Tommy Poland has experienced Bigfoot, too. He’s 43, married with two young children. He lives in Trinity, and he’s a former Bigfoot investigator. He recently stepped away from his years of research to work on becoming a family pastor. But before that, he interviewed dozens of people who claimed they have seen something huge and ape-like in the Uwharries or have seen the big footprints and heard the wood knocks and the guttural screams in the middle of the woods. It happened to Poland. He has heard the loud knocks on tree trunks in the forest, and he has discovered a big footprint, size 13, at least four inches wide at the heel and at least eight inches wide at the toe. So, what does Poland tell his children, Elijah, 10, and Molly, 7? Harvey Younts asks the same question. After retiring from Walmart, Younts bought a gold mine in Montgomery County; he knows these hills — and what they hold — well.